In this interactive place value activity, second grade students will solve problems with place value. This quiz has 10 problems: some multiple choice, several drag and drop items, and a few matching problems. 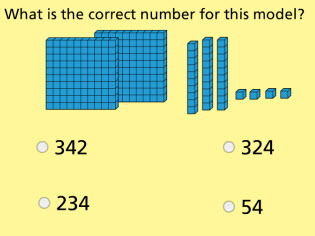 Kids will use models, words, and numbers in expanded form to represent numbers to up to one thousand. Return from this Place Value to 1000 Math Test to the Elementary Math Tests , 2nd Grade Math Tests webpage, or to Math Tests.